Allow Copy (Form Sharing): By default this option is checked when you select Share. Checking this option will allow an Admin of the profile the form is shared to to make a copy of the form to their profile. Assign Selected: Assigns the record out to a specified user(s) device for them to complete. Assign-To Widget: The "Assign To" widget allows the user collecting data, to send the data they just collected to another user. Attachment Link (Input Properties): Define the path of the attachment that will load (local or external). Attachment Widget: The Attachment Widget links local (PDF, .MOV, .MP4) or external web content (connection required) within iForm. Auto Save: With Auto-Save enabled, the application will save all changes automatically after three seconds of inactivity. By Default Auto-Save is disabled. Auto Sync: Auto syncing enables the device to try and sync any time a new record is captured and the user returns to the form menu. Belongs to the Page (Info Tab): The ID number of the Form you are currently working with. Challenge Password (iForm ES): Going beyond a device password that is part of iOS, iForm ES asks the user to enter a challenge password every time the application is opened. This password is required to enter the application, and ten failed login attempts will wipe the local database on the device. Client Customization: Client Customization is where you can view or edit the custom welcome screen. Client Validation: The client validation value must be true for a particular element to pass validation. Unlike Dynamic Value and Conditional Value where the content usually references other elements, the client validation content usually references the name of the element that it is set for. Collect Rights: Enabling Collect rights for a form will allow the user to collect records from the device for the specific form. Conditional Values: Conditional Values determine whether the element containing the conditional statement will be visible. Create New Record: Creates a new record for the database table in which you can populate the record with data. CSV File: A CSV file is a comma-delimited file that you can easily edit using spreadsheet software like Microsoft Excel. When you download your table contents as a .csv file, each of the fields in the table is represented by a separate column in the spreadsheet and each of the items in the table is listed in its own row. Custom Color Scheme: Colors that are applied to the general interface on your Server. Data Size (Input Properties): Controls the number of characters that can be entered for that particular element. Data View: Simple reports generated in the browser by consuming the JSON feed. Date Widget: The date widget allows users to capture a past, present or future date stored in a localized format. In the U.S. the date will appear as Month-Day-Year. Date-Time Widget: The date-time widget allows the user to combine the functionality of both the date and time widget together. Delete on Upload: Enabling this option will remove all captured form records that were stored on the device since the last upload. Delete Selected: Deletes the selected record(s) from the table. Disable Automatic Allow Copy (Form Sharing): Checking this option will NOT automatically select the Allow Copy check box when a user selects Share. Divider Widget: The divider widget is a thin horizontal line that can be used to break up sections within a form, or separate specific widgets from the rest of the form. Dynamic Label: The Dynamic Label field is used to change the label text of any element based on specific conditions. Dynamic Value: This field is used to apply a value to an element based on specific conditions. Element Encryption: Using iForm ES allows users to encrypt data inputs (except media). Element ID (Info Tab): Identification Number of the element in the form. Element Index (Info Tab): Number of the element on the form. Used with DISPLAYFIELD Reference ID. Email Widget: An e-mail widget can be paired with an option list of popular domain names to send e-mail records of the form to the entered address. Empty Table: Deletes all the records in the Database Table for the Selected Form. Encrypted Local Database (iForm ES): The local client database is encrypted, so even if the device is lost or stolen, your data is safe from extraction via jailbreak. Form Assignment: Form Assignment gives users rights to a specific form. Form Group: A Form Group is a list of forms inside a group that can be assigned all at once simply by selecting the name of the Form Group and all of the forms inside that particular group will be assigned to the users device. Form Sharing: The ability to share forms with other profiles. Hide Typing (Input Properties): Password style masking for text input. HTML: HTML stands for Hyper Text Markup Language. HTML documents are also called web pages. HTML View: Use the HTML View to see how your reports will look if they are being emailed. Hour Glass Icon: This indicates that a form is ready to be uploaded. iForm ES: iForm ES was created for projects that require the high levels of security needed to be HIPAA, FISMA, and ISO9001 compliance in mind. iForm Kiosk: iForm Kiosk is the quickest, easiest and most versatile application for turning any iPad into an instant end user Kiosk. Perfect for event check-in, mobile lead capture, and end-user generated surveys, iForm Kiosk combines the complete brandability with unparalleled form building and ultimate security. Image Option List: You can link images to options in a list by creating images with the same file name as the option key value. Image Widget: Use the image widget to capture a photo from your device's camera (if equipped). You may also select an image from the photo library stored on your device. Image Label Widget: The purpose of this widget is to let users add images to their forms. Since these inputs are labels, they will not appear in your data, and will only be visible on the device. Info Tab: In the Info tab, database and version information for the selected input is available. Input Properties Tab: The Input Properties tab allows you to select the type of Widget you wish to you, as well as some additional controls. Key Value: The key value is the unique ID given to an item in an option list. NOTE: Each Key_Value in an option list must be unique or will receive this error. Label Widget: The label widget is a way to add text to your forms and can be used to identify different sections within the form. License: A license is defined by a Username and Device ID combination. For example, if the same user logs in on multiple devices, it will consume a license per device. LineaPro Widget: With LineaPro widget you can swipe Licenses, scan Barcodes and have the data populated directly into your form in the application using any LineaPro device. Link Mode (Smart Paging Properties): The link mode determines how many records can be captured for this particular subform element. Single will restrict the user to one record, while multiple will allow for X number of records to be captured. Location Widget: The Location widget is used to capture GPS data of the current geolocation when the element is entered. MagStripe Widget: Utilize the MagStripe Widget with Linea-Pro or MagTek - iDynamo to caputre information from a Swipe of a Credit Card, Drivers License and More. Masking Widgets: Masking Widgets make it easy to enter in common information such as phone numbers, zip codes, and social security numbers. As we all know, these numbers can be requested to be captured in all different formats. The masking feature makes it easy to customize the number layout according to your specific needs. Be sure to watch the short YouTube video below that will explain all about the widgets that have the masking feature. Meta Data: Metadata is data (information) about data. Multi-Select Widget: The multi-select is just like the pick list widget, except users may select multiple items from the assigned option list. Navigation Tab Customization: This section enables you to change what is shown on the Company and Support Tab of your server. 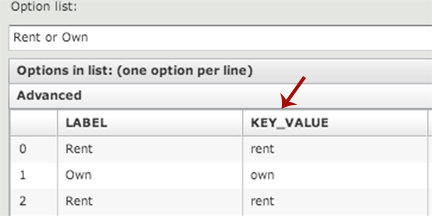 Non-Unique Options: Option Lists can have duplicate labels provided they have different key_values. Number Widget: This widget only accepts numerical entries and has a default limit of 50 characters. As mentioned above only the first 14 digits are written to the database with the number of 0's indicated by scientific notation. PLEASE NOTE: Do not capture numerical data that should be stored as a string using this input. And any data entered in a number field will be rounded after the 14th digit and stored in the database in scientific notation. Phone Number Widget: The phone number widget is used to capture localized phone numbers. Use the masking capabilities to get the most out of this widget. The mask can also be customized to meet your specific needs. Pick List Widget: The pick list widget is similar to the select widget, except it opens a new window within the application that lets the user see the choices in a more accommodating view. Use this element if a select widget is too small to handle your list. Portal Branding: Allows images to be replaced with your own graphics to change the look and feel of the Admin Portal. QR Code Widget: The QR Code Widget can be used to scan QR codes using the Built in Camera on the device. The Purpose of this widget is to Scan QR Codes and Pull the information from the Code into an element on the device. Range Widget: The range widget is used when a numerical value needs to be selected from a range of values. Rating something on a scale of 1-10 is a good example. Simply place 1 in the "Low Value" field and 10 in the "High Value" field. The users filling out the form will only be able to select a value between 1 and 10. Read Only Widget: This widget performs similarly to the previous "read-only" function check box with the exception of, now, being manipulated by dynamic values. One cool thing about the read-only widget or read-only attribute of a text widget is that you can use them to create a date and time stamp. To do this, just write Date() in the dynamic value of the widget. RedLaser Widget: The RedLaser widget can be used to capture 1D and 2D barcodes and encode the data directly into the form for submission. In order to use this widget, the client will need a device with a camera. Simply point the camera at the barcode once the widget has been opened. Please note, RedLaser functionality requires a $0.99 In-App Purchase through your iTunes account. The upgrade is downloaded from the application Settings page. Required (Input Properties): Elements set to required will be enforced if they are showing on the client and have not been satisfied when the user presses "Done". Reserved Words: A list of words that cannot be used as a data column name. Click HERE for the list. RSS: Really Simple Syndicate is a family of web feed formats used to publish frequently updated works. Select Widget: The select widget is used in conjunction with an option list. All of the options contained within the list will be shown to the user on the form. This widget only allows a user to select one of the options defined by the list. Use this widget when you have small lists and short options to work with. Send Email (Input Properties): Set this flag on an E-mail element to send a copy of the data to the addressee in an HTML formatted e-mail once the record is uploaded to the server. Separate Table View (Smart Paging Properties): Choose this option if you want to see the subform records in a separate table view (rather than display the subform record summary below the element). Server Admin: A Server Admin is a user that can manage different companies within your database. Share (Form Sharing): Checking this Box will share the form with the selected profile and this form will appear in the Form Assignment section to assign to users. Signature Widget: The signature widget is used to capture data that has been drawn freely with the user's finger. Sign work-orders, draw sketches and even rough diagrams, all with the tip of your finger. Smart Option List: Option lists that contain smart controls can populate elements based on user responses. Smart Paging Tab: Smart Paging tab only applies to sub-form elements. This feature allows users to select any form they have created to be used as a sub-form. Using sub-forms can increase application speed for projects that require a lot of conditional logic, or contain a lot of questions. Rather than place all of your form elements in one long form it is beneficial to chunk information into sub-forms. Smart Table Search: Smart Table Search is a feature allows you to perform a local search on any data table. Sound Widget: The sound widget can be used to record voice memos on the devices that have microphones. Splash Screen (iForm Kiosk): the splash screen is the first screen you see after the app loads. It is also the screen users will be taken to if the app time’s out. SSN Widget: The SSN widget is used to capture data in the U.S. Social Security number format. The mask can be manipulated to meet other data needs as well. Sync on Start: Selecting this option will automatically try to sync the device when the application is opened if a connection is present. Subform: A smaller form used to breakup your larger form for more manageable date. Subform Menu (Smart Paging Properties): This menu allows you to choose what form you want to use as a sub-form. Since all forms on your account appear in this menu, any form can be a parent or a sub-form. Subform Widget: The subform widget can be used to create sub-section of a larger form. It is more efficient to create smaller "subforms" and place them inside a parent form. Subform widgets can be configured to allow for only a single or multiple paging. Click this button to subscribe to the thread you are viewing. Text Area Widget: The text-area widget is a multi-line text entry field that can be used to send larger messages that will not fit into a normal text widget. Text Widget: This widget only receives alphanumeric data and has a default limit of 50 characters. Change the data size to expand or restrict the character limit (Just not on a live form!!! Remember Golden Rule #2). Time Widget: The time widget allows users to enter in a time, based on a localized format. The U.S. display will appear as "hh:mm:ss:" AM/PM. Toggle Widget: The toggle widget is used for questions that are either "on, off" or "yes, no" questions. It is a simple way to have someone filling out the form validate the question. Total Licenses Allowed : Maximum number of users/licenses that can be distributed over all of the profiles on the database. This number will show the number of licenses that have been paid for plus 2 additional users for support purposes. Total Licenses Allocated: This number indicates the number of licenses that have been assigned to active or suspended companies. This number can never exceed the "Total Licenses Allowed" number. Total Licenses Activated: This figure tells you how many active license entries exist, which is a sum of all licenses on the entire database across all companies. UnAssign Selected: Removes the Assignment of the record to a specified user(s). Unique ID Widget: The unique ID widget creates a unique server ID that can be customized using the "Prefix" field to create work-orders or invoice IDs. The unique ID is generated on the server side once the record has been submitted. It is commonly hidden on the device using a condition value of false. When the Unique ID input type is selected the Prefix defaults to INV- which can be customized. Upload CSV Data: Allows the user to upload CSV data for the existing table. Validation Message: This message will display to the end user in a pop-up window if the client validation fails. View Detail: Opens the HTML View of the record selected. View Rights: Enabling View rights for a form will allow the user to view data collected for the specific form. Widget: A widget is a term that is used when describing the type of input property an element has. XML: XML stands for Extensible Markup Language. It is designed to carry data, not to display data. It was created to structure, store, and transport information. Zip Code Widget: The zip code widget is used to capture U.S. Postal codes. Users can configure the masking capabilities to meet other data needs as well. What is Trigger Post processing?